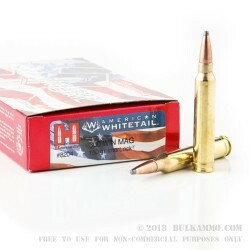 That prized buck only comes every so often, so make sure you’re prepared with Hornady American Whitetail .300 Winchester Mag. Hornady’s INTERLOCK bullet technology has revolutionized hunting for whitetail deer. This technology features exposed lead-tipped bullets, allowing for controlled expansion and powerful performance, with devastating results. These feature the exclusive INTERLOCK ring, which is a raised ring inside the jacket that keeps the core and jacket together during expansion. This means more weight retention and energy upon impact, making this a highly effective deer round—making for less tracking after shooting this deer season. These .300 Winchester Mag round comes equipped with 150-grain soft point projectile, in boxer-primed, noncorrosive reloadable brass cases. 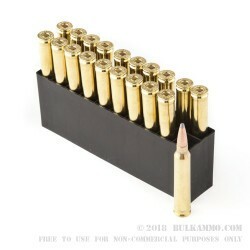 These rounds are great for deer, or even larger game, and come 20 cartridges per a box. At the forefront of ammunition technology, Hornady has become a world leader in ammunition production. 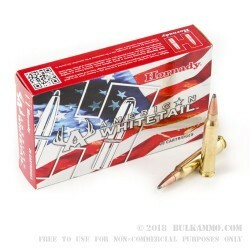 Beginning as a reloading supplies company, Hornady has become an American ammunition institution, producing some of the most reliable and accurate ammunition available.